"Scopin' the Topo, One Wetland at a Time"
The 2012 ELP Restoration Research team collaborated with the City of Eugene, the Institute for Applied Ecology (IAE) and the Lane Council of Governments (LCOG) to assess the relationship between microtopography and species diversity in restored and remnant wet prairies in the West Eugene Wetlands. The full importance of microtopography in wet prairies is not understood and the intent of our research was to determine the relationship between microtopography and species diversity in order to aid future restoration projects. 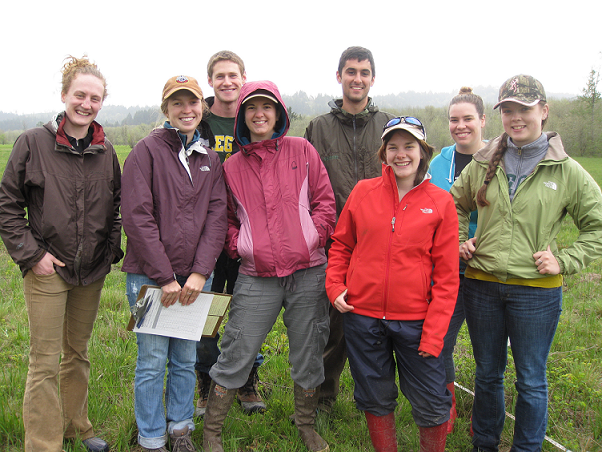 The Environmental Leadership Program (ELP) is part of the Environmental Studies Department at the University of Oregon. This program provides undergraduate students with a unique opportunity to develop leadership, communication and professional skills through service-learning projects with a variety of community partners. ELP consists of two focus areas: Conservation Science in Action (CSA) and Environmental Education (EE). CSA teams participate in hands-on environmental restoration and management projects throughout the local community. EE teams create environmental education experiences for local school children. Students participating in ELP commit to two terms, in which they gain the necessary background knowledge and skills for their project, conduct their project and produce a final product.